SB 262, a bill offering protection against discrimination to lesbian, gay, bi-sexual and transgender individuals in housing and workplace environments not brought up for discussion Monday on the Senate floor, effectively killing it for 2013 because of lack of votes and issues with the Mormon Church. Utah Senate President Wayne Niederhauser, R-Sandy, said the bill didn’t have the votes, so it was wise to spend the day focused on bills that potentially could be forwarded to the House. He said The Church of Jesus Christ of Latter-day Saints was one of several parties involved in discussions on the measure. Sen. Steve Urquhart who sponsored the bill called news conference late Monday, Urquhart expressed frustration the bill didn’t come up for a vote, but said he has seen significant progress on the issue. He said in his 13 years in the Legislature, he has seen a lot of issues that are entrenched, but he said he sees movement on the equity issue. Sen. Jim Dabakis, D-Salt Lake City, who is gay, added “The votes just weren’t there, but the work continues one senator at a time, one vote at a time. We really did come this close. We just didn’t close the gap. We’ll begin in a couple of weeks to start sitting down and see if we can finally come to a conclusion with the LDS Church,” Dabakis said. Hasn’t anyone in this country ever heard of “separation of church and state” or “cult and state” in this case. 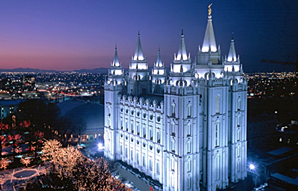 Very recently, the Mormon Church refused to support a Utah bill that would protect gays statewide from discrimination in housing and employment. Yesterday, the Mormon-Church-controlled, overwhelmingly Republican, Utah state legislature killed that bill. The stated reason: anti-discrimination laws for gays are a slippery slope to gay marriage. More broadly, the Mormon Church is saying that it won’t allow LGBTs any legal rights at all in Utah because it may eventually lead to them having full equal rights. What it really means is that the Mormon Church won’t allow LGBTs any legal rights at all in Utah because that might complicate its eventual future wholesale cleansing from society, when they decide that the time is right, of all the LGBTs they haven’t already destroyed through it’s ongoing and current less direct means — as in genocide. The Mormon Church, it’s top leaders and the vast majority of Mormons are really just evil, filthy-rich lackey, bigoted, scapegoating, Nazi pseudo-Christians shoving their crackpot ideology and agenda down — and eventually through — the throats of all who disagree with them.